Chichen Itza was the largest and most important Mayan city in the Mexican state of Yucatan. 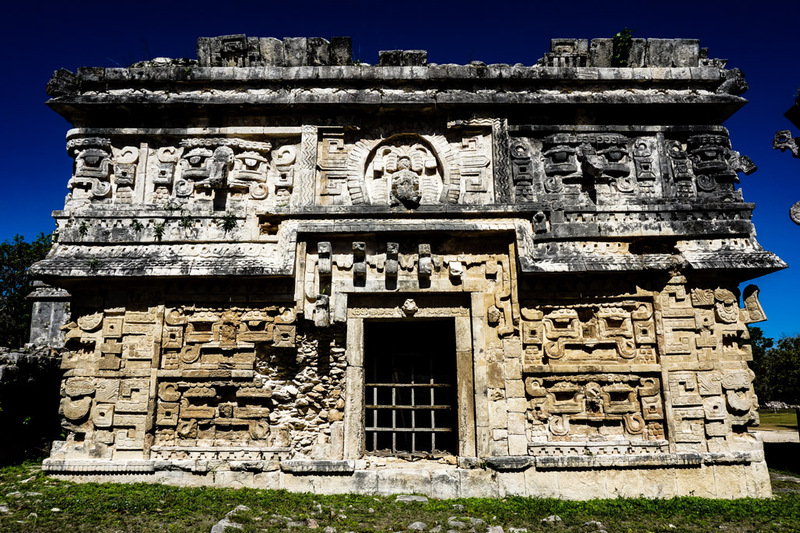 Parts of it date back to 800AD and show that the Mayan people occupied the city for several hundred years. Despite being long abandoned, Chichen Itza still stands in remarkable condition. 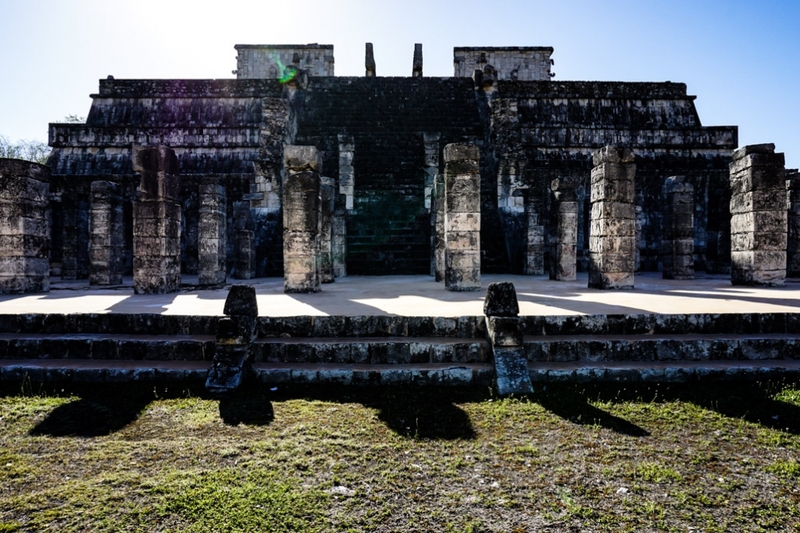 The site boasts temples, pyramids, cenotes (sink holes), a great ball court, an observatory and an extensive collection of ancient ruins. Ancient ruins in Chichen Itza. 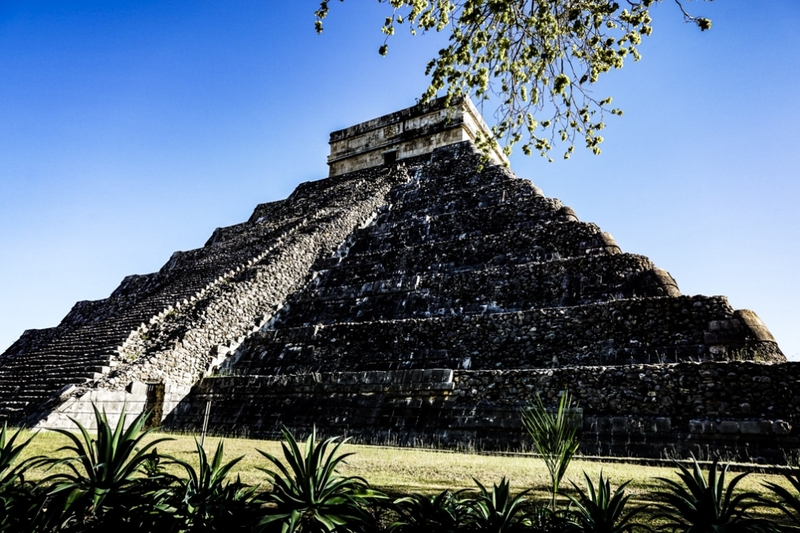 El Castillo is the most well known pyramid, named after Spanish explorers. For years researchers have worked to uncover information and history that alludes to the lost culture of the Mayans. Hieroglyphs are slowly and tediously being deciphered, made hard by destruction of this language by the early arriving Spanish. 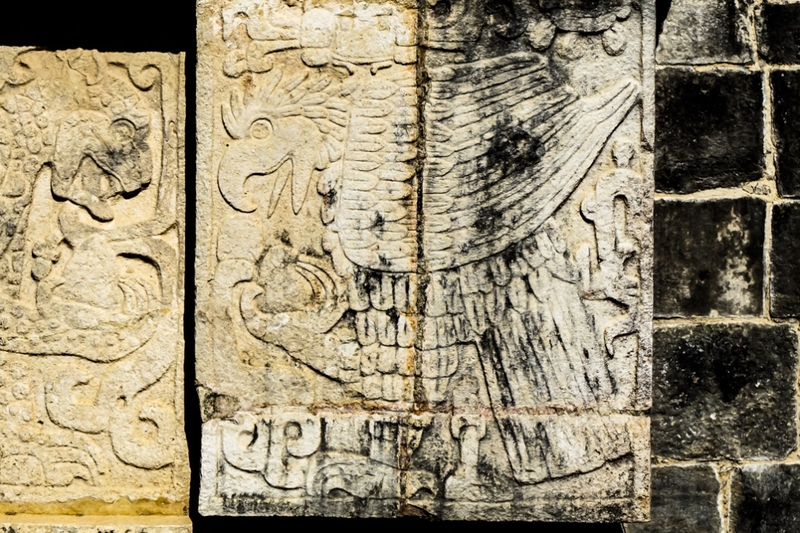 This research has allowed us to glimpse at the dark, fierce and haunting past of Chichen Itza. The observatory of Chichen Itza, a supposedly haunted structure. 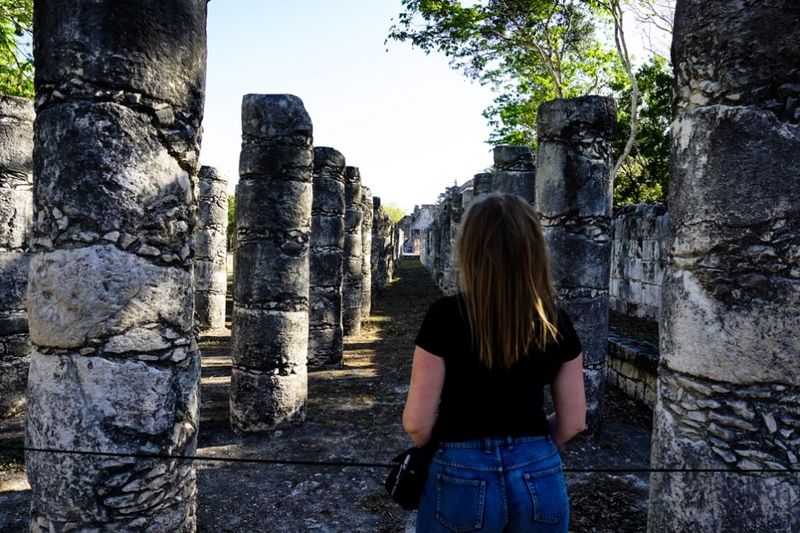 Like many ancient cultures, the Mayans who inhabited Chichen Itza, exhibited very different cultural actions and beliefs to the ones we have today. To us, their way of life and rituals seem dark and barbaric, yet this was how they paid respect, interacted with and pleased their Gods. Looking down the Plaza of 1000 Columns at Mexico’s Chichen Itza ruin site. 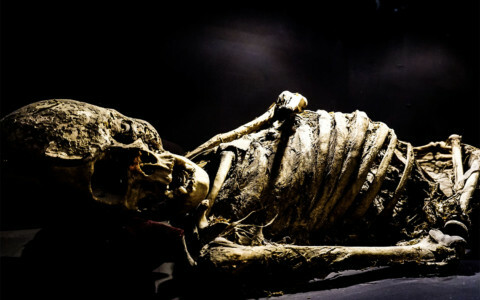 Death was viewed uniquely by the Mayans. They saw it far less negatively than typically perceived today. In this time, it was viewed as the next leg of their journey into the afterlife and at times was sought after and celebrated. One feature which distinguishes Chichen Itza’s from other Mayan ruins throughout Mexico, Belize and Guatemala is the sheer size of its ball court. These structures were built to house many spectators who would cheer as two teams went head to head in a unique sport, consisting of hitting a small ball with the hip through a round hoop. Games saw teams fight to the death, ending in a bizarre twist where the winning team’s captain was sacrificed. This form of death was seen as a great honor and is depicted within art works carved into the stones that line Chichen Itza’s great ball court. These carvings show armored men engaging in the sport and one man knelt down, decapitated with snakes splaying wildly from his neck wound, symbolic of the blood squirting from his major arteries. Rock carving displaying a decapitated athlete with snakes bursting from his neck wound, symbolizing blood spurts. In fact, sacrifice was a common thing for the Mayans. It was seen as a way to appease the Gods and blood was offered ritually and frequently during times of disease, drought and famine. One area of Chichen Itza, which fascinated early researchers and continues to fascinate the masses today, is the great Cenote (sink hole), located behind the main pyramid (El Castillo). It is apparent that this place was a sacred one for the Mayans. They deposited a great deal of artifacts into its deep waters, including jade, which was precious to the Mayans like gold. It is thought that the Mayans believed this Cenote to be a gateway to the underworld and a direct connection to the rain god, Chaac. 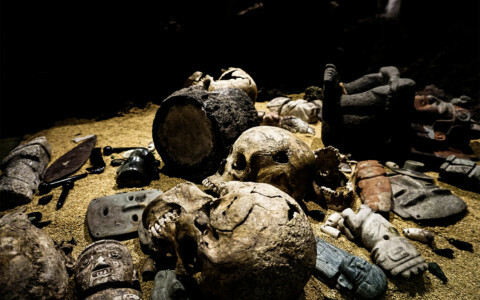 In addition to the precious items found at the bottom of the Cenote were hundreds of skeletons, including those of many children. It is thought that these individuals were sacrificed, pushed into the Cenote from above to appease the Rain God and hopefully break the devastating drought experienced by the Maya people. Looking down into Chichen Itza’s Grand Cenote, once a place of mass human sacrifice. Further sacrifices are believed to have been conducted within the great pyramids of Chichen Itza, including the main central pyramid, known to many as El Castillo. 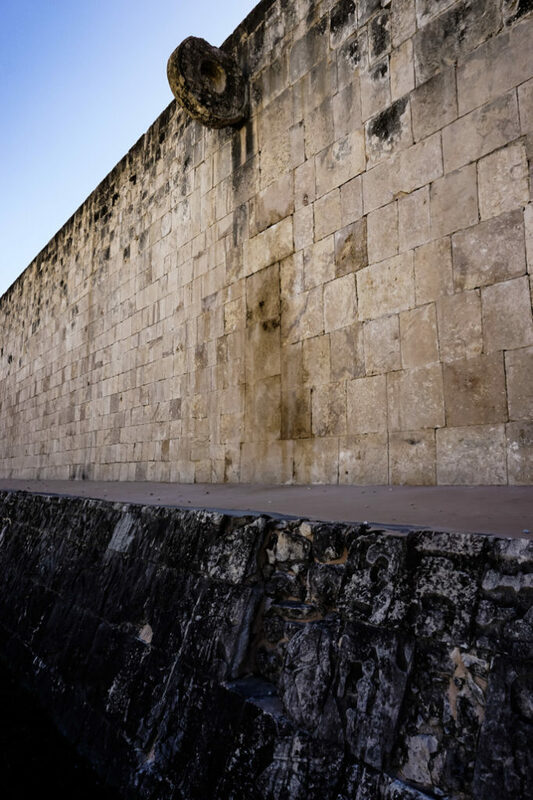 Here, victims would have been killed at the top temple section of the pyramid and would have primarily been prisoners captured during warfare. 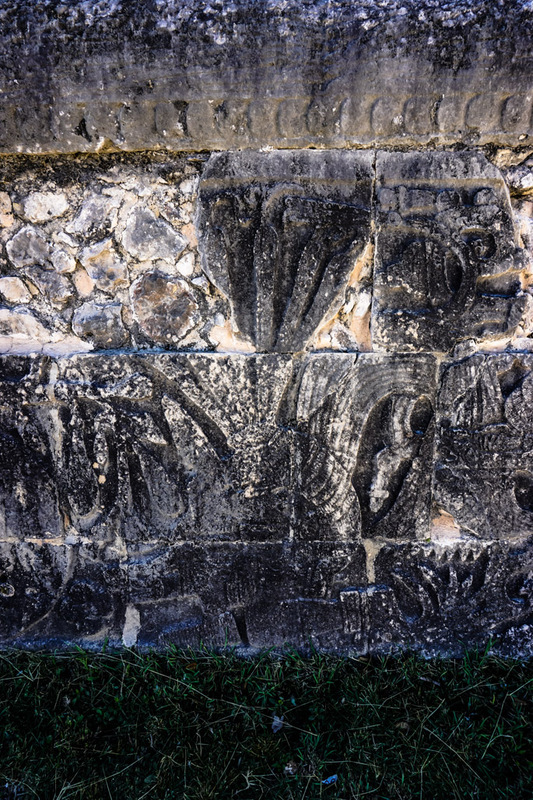 The scale of these sacrifices and barbaric nature is captured in more artwork within Chichen Itza, showing rows of pierced skulls on stakes, which would have been displayed at the site as an imposing symbol of power and warning to outsiders. 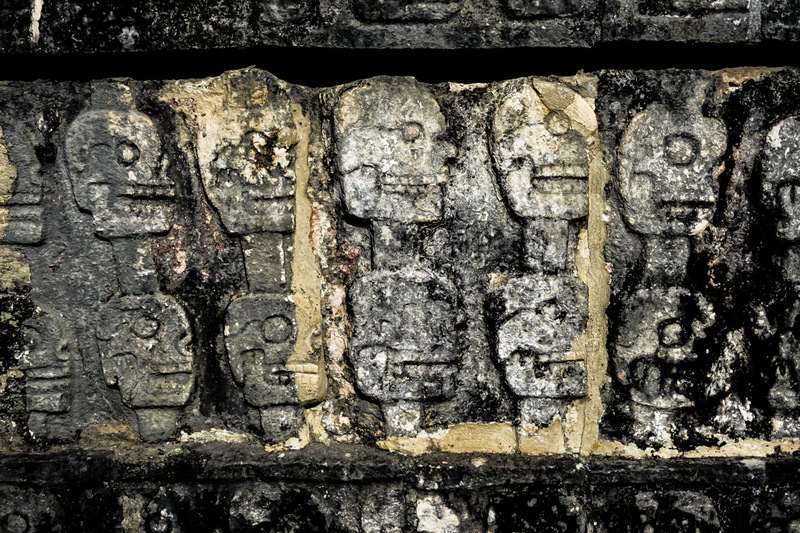 Rock art displaying hundreds of skulls pierced and displayed on stakes at Chichen Itza. 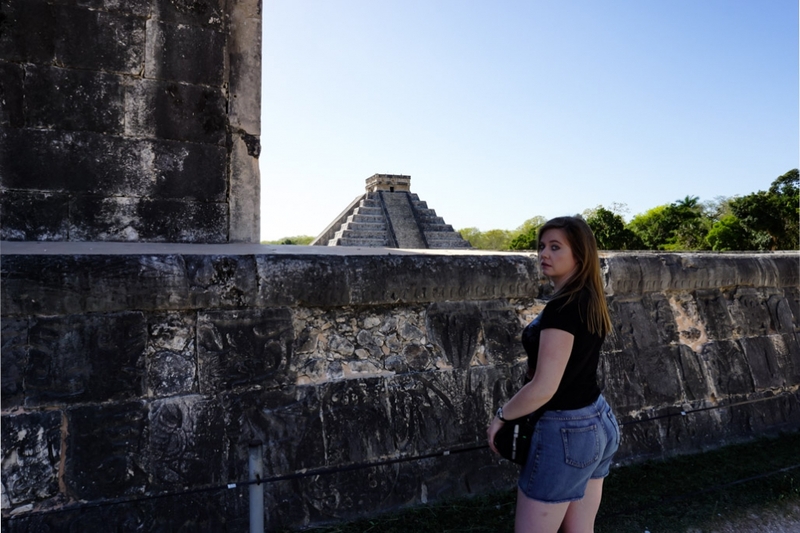 Chichen Itza has a turbulent history linked heavily with death, leaving little doubt as to why it is commonly considered one of the most haunted places in Mexico. The great ball court of Chichen Itza. The largest to be found. Shot of the hoop, balls would be hit from the hip through. Many have claimed to sight shadow figures within pyramids (formerly open to the public) and see the apparitions of ancient spirits roaming the grounds of Chichen Itza. Many believe that these may be the souls of human sacrifice victims trapped and cursed to walk the site, unable to cross over. One of the many temple ruins remaining at Chichen Itza. Others claim that these may be priests still guarding and protecting their sacred, religious site. 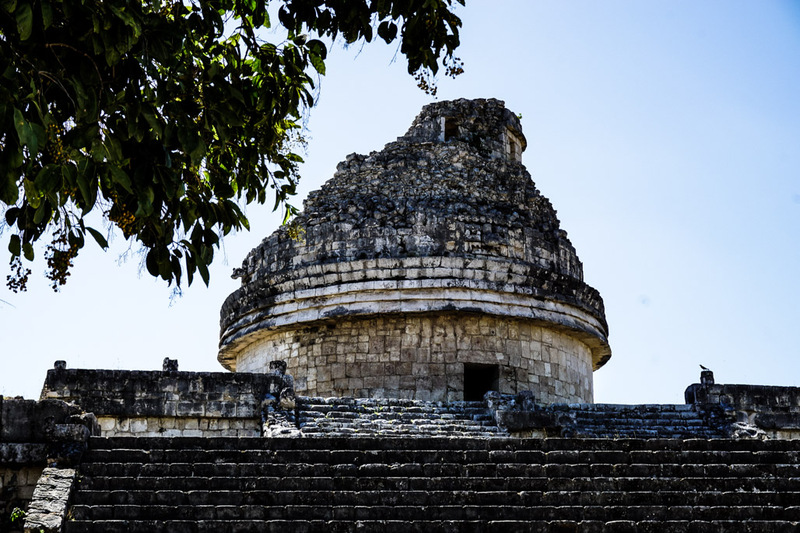 This theory is further reinforced since the most active paranormal site within Chichen Itza is said to be the observatory and not the places of sacrifice. The Mayans were extremely advanced, being able to predict astronomical events with great precision. This work was of great importance and one that spirits may continue to be conducting, even in death. Ruin of the haunted observatory at Chichen Itza. Supposedly haunted by the ghosts of former priests. Numerous other paranormal occurrences have also been reported at Chichen Itza. Many have felt the feeling of nearby invisible presences, sudden temperature drops, disembodied voices and sounds, particularly those of ancient tribal hymns. There have also been some disturbing accounts of spiritual attachment that visitors have documented online. These tell of ancient spirits that have followed visitors home to haunt their dreams. Standing in the great ball court of Chichen Itza, admiring art work of sacrificed ball players with El Castillo in the background. Chichen Itza is a must visit for tourists passing through Southern Mexico. It is most popular with tourists commuting from Merida, Cancun and Tulum on day trips to visit the ruins. Due to its close proximity to these destinations and breathtaking landscapes, Chichen Itza can become extremely busy later during the day. 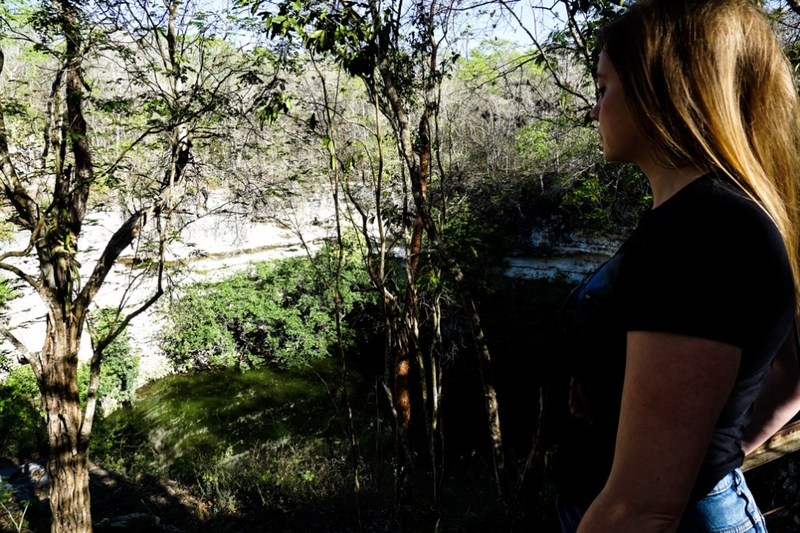 If you are like me and try hard to avoid hordes of tourists, especially to get those perfect photos, I recommend a stay in Piste (closest town to the ruins) where you can walk within 20 minutes to Chichen Itza and arrive at opening to be one of the first within the park. More artwork depicting a jaguar and eagle, both eating human hearts. Make sure to bring plenty of water and sun protection as you’ll want to spend some quality time wandering the park. You will do a decent amount of walking but nothing overly strenuous as you cannot ascend any of the ruins. Tour guides can be purchased at the entry of the park, or you can explore at your own leisure. Front shot of a temple on the haunted grounds of Chichen Itza. 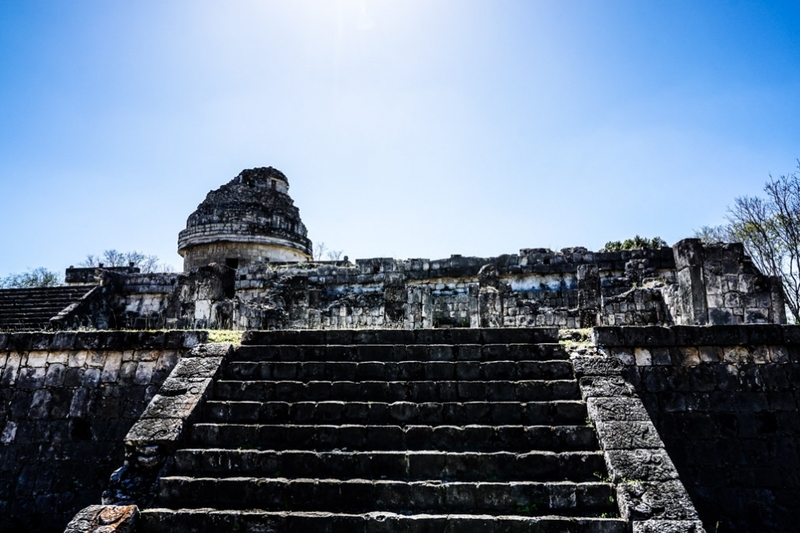 Don’t miss your chance to explore these mysterious Mayan ruins, which are some of the best-preserved surviving ruins around. 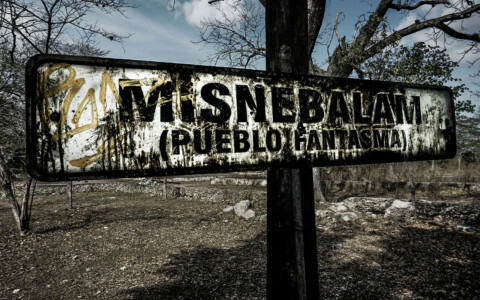 If you enjoyed this article and want to learn more about other haunted places in Mexico, check out Misnebalam, a haunted ghost town just outside Merida.